Olefin hydrocarbons are valuable raw materials for petrochemical and polymer manufacturing. Highly effective, but toxic chromium-containing catalytic materials are the most widely used catalysts to obtain olefins in industry. In this regard, the urgent challenge to increase the efficiency of oil processing is to develop the catalysts with low content of harmful active component. In the present study, the catalysts with low chromium content (1 theoretical monolayer = 5 Cr atoms per nm2 of support) were synthesized by incipient wetness impregnation of the supports (Al2O3, ZrO2, CeO2, and CexZr(1–x)O2). The samples obtained were characterized by low-temperature nitrogen adsorption, X-ray diffraction and H2-temperature-programmed reduction methods. 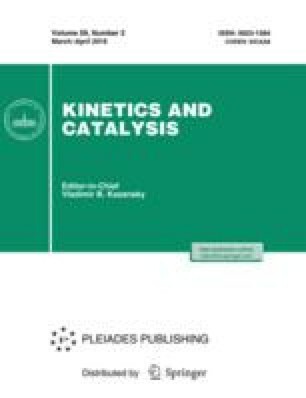 The catalytic properties of the catalysts were tested in isobutane dehydrogenation reaction. It was shown that the state of chromium on the surface is different over different supports. For the CrOx/CeO2 catalyst, the formation of Cr2O3 particles with low activity in the dehydrogenation reaction was observed. For other samples, a highly disperse X-ray amorphous state of chromium was characteristic. The catalyst based on CexZr(1–x)O2 was the most active in isobutane dehydrogenation reaction due to possible stabilization of chromium as Cr(V) state. Original Russian Text © T.A. Bugrova, G.V. Mamontov, 2018, published in Kinetika i Kataliz, 2018, Vol. 59, No. 2, pp. 169–176.